Have you ever cooked quinoa before?! Are you intimadated because it’s a funny looking word and a funny looking grain?! Are you afraid of how it will taste, or if your family will like it?! I’d love a second to speak to these concerns! Cooking Quinoa – It’s very similar to cooking white rice, takes about the same amount of time and uses the same cooking method. Bring about 2 cups of water for every 1 cup of quinoa to a boil. Stir in the quinoa and return to a boil. Cover, reduce heat to medium and cook for 15-20 minutes. The little white ring around the grain will separate from the grain when it is finished cooking. When adding in different ingredients, it’s best to mix them in during the last 5 minutes of cooking, to ensure that the quinoa soaks up all the liquid it needs to cook properly. 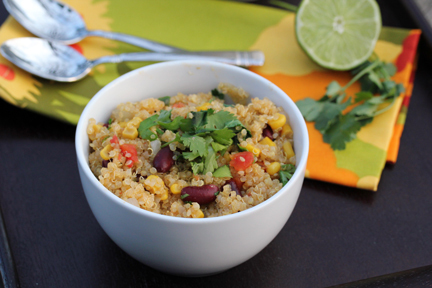 Taste – Quinoa doesn’t have much of a “distinctive” taste. Again, it’s similar to rice in that rice doesn’t have a distinctive flavor, and neither does quinoa. Will the Family Like It – When you add in familiar, likeable flavors like lime, cilantro, tomatoes, corn and beans, you might be surprised to find that they just might like it after all. Now, where is the best place to find quinoa?! Where is it cheapest?! Costco – Sells 4 lb. bags of organic white quinoa for $10 each, or $2.50/lb. Whole Foods – sells both white quinoa and red quinoa for an average of $4.99/lb. In a Dutch oven or large saucepan, bring 2 cups of vegetable broth and 2 cups water (or 4 cups of water) to a boil and then add the quinoa. Return to a boil and then reduce heat to medium and cover for 15 minutes. Once the little white rings have started to separate from the grain (after about 15 minutes), add the crushed garlic, finely chopped onion, drained can of corn, undrained can of Rotel, drained can of red kidney beans, cumin and salt and pepper to taste. Squeeze in the juice of 1 lime and stir. Let simmer another 5-10 minutes. Remove from heat and keep covered until ready to serve. This looks great! I’m going to make it for dinner tomorrow. Thanks! This looks delicious will try it soon. 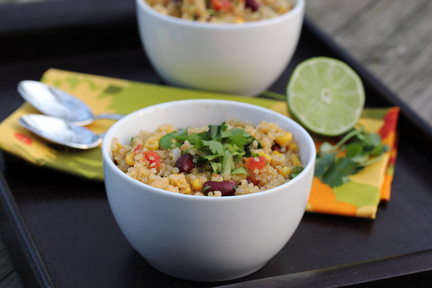 This is definitely one I’ll be making this week, I adore quinoa! Thanks. This looks tasty. I am going to try this one. I will try this next week! Yummy! I know it is an extra step, but I will toast the quinoa first- Always toast my quinoa for recipes. It just brings a nice nuttiness. How do you roast your quinoa? I’ve been wanting to try quinoa. Thank you for the recipe. I have to admit I am a little scared of quinoa as well. 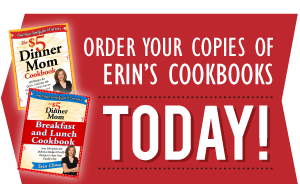 I bought it and made a sweet breakfast recipe and hated it. So I look forward to trying something savory. It is amazing how scared I can be of one ingredient. Silly but look forward to incorporating it into my families diet. Too bad it is a little pricey though. Look forward to trying this recipe out. It’s really not scary at all IF you buy the kind that says “pre-rinsed” on it. With some brands, if you don’t rinse the quinoa, it can be soapy tasting. I just started using quinoa and love it, i steam it like rice then brown some garlic and onion in a little coconut oil then add the quinoa saute for a few minutes, put on a late than fry an egg put on top, delicious. I also make tortillas with raw quinoa and water in the blender to make a light batter cook like a pancake and put beans and salsa on top delicious. ENJOY. Yes be sure to buy the pre rinse makes a difference, that was plate in the previous message. How do you make quinoa tortillas again? Do you have a recipe that could share? I would be thrilled to try this! I am going to be making this one this week. Sounds yummy and I want to do more with quinoa. I’m going to make this one this week. I’ve been wanting to try Quinoa and this looks like the perfect recipe to start with. i use a similar recipe with bulgar wheat instead of quinoa, but now i’m going to try this instead. i like quinoa. thanks for the buying tips. we don’t have a costco, but have sam’s. i purchased it at the health food store (cheaper than walmart). My favorite place to buy quinoa is through Azure Standard. It is $2.29 a lb. You do have to buy it in bulk though. You can leave it out Sarah, and just add it as a garnish to those who are want the added flavor. They can mix it themselves into their bowls. Quinoa absorbs flavors it is next to. We always cook quinoa in chicken stock which flavors it well. Make sure to rinse your quinoa before you cook it, otherwise it can have a bitter taste to it. Also, cooking it in chicken broth helps a lot. I make something similar to this often, and half an avocado on top makes all the difference. When I purchased the ingredients for this, I picked up diced tomatoes per the ingredient list. When I was preparing it, I noticed the directions call for Ro-tel, which is diced tomatoes with green chilies. I added a teaspoon of taco seasoning to try to replace the flavor of the missing green chilies. I also ended up adding a second can of diced tomatoes. Let this dish sit for a couple of hours for the flavors to come through. It is very good and I look forward to trying it with Ro-tel. Thanks! Can this dish be prepared and frozen in batches? Was at Sams Club today (1/18/14) and they are now carrying quinoa. What became of the link to the Rice, corn and pinto beans recipe? Sorry for redundancy. Thought original comment didn’t post. I recently bought the 4 lb bag of quinoa at Costco and it was $20! Maybe it’s more expensive in California than in other places but I was a little surprised! We just made this for dinner tonight, and it wasn’t too bad! I cooked the quinoa a little too long (burnt on the bottom), so that might have altered the flavor. Mixed in a spoonful of nonfat greek yogurt in my bowl, and it came out really creamy and REALLY delicious! 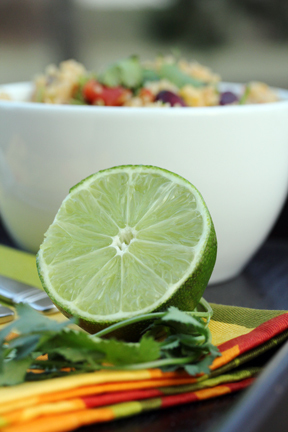 with Kidney Beans, Corn and Lime | Recipes | One Dish Dinners < Loved it! 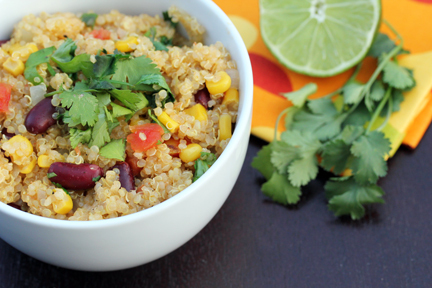 Our family loves quinoa, I am going to try this recipe. One thing I learned about cooking quinoa is alway rinse, it will be worth the extra step. Though I have gotten in a hurry and forgotten and it doesn’t always happen, but sometimes it gets a bitter taste if you don’t rinse, maybe it depends on how your quinoa was processed each brand may do things differently, regardless it’s safer to rinse by putting in wire mesh strainer and running hot water over for a minute or two to guarantee the best flavor. Quinoa for $2.50#?? WOW awesome price!